The steps needed to restore your Brick Pavers are relatively easy. All you need to do is clean, resand if needed, and apply a sealer. Paver Sealers can enhance the natural colors of your brick and come in Matte, Semi-Gloss, and Higher Gloss shine. If a "shiny" appearance is not desired then you can just add a Concrete Water Repellent for Protection only. The use of a pressure washer is suggested when cleaning the brick pavers. Cleaning chemicals are not needed when removing dirt, grime, and vegetation. If you have stains on your brick pavers then we would suggest using a cleaner that is specific to the type of stain. i.e. Rust remover to clean rust, Oil stain remover to clean oil drips, etc. Allow the brick pavers to dry thoroughly for 1-2 days. If needed, sweep in new jointing sand between the stones. There is many types of sand that you could use. The most popular is playsand or babysand. Other options can be jointing sand and polymeric sand. These types of sand are usually found only at paver stone yards. Make sure the sand is dry and not wet! Blow or sweep off excess sand. We strongly suggest that the sand level is at least 1/4" from the top of beveled edge of the paver bricks. Be very careful to remove all the sand! Apply sealer by rolling or spraying. If rolling, take extreme caution to make sure that you are not removing the sand from the joints and leaving it on top of the pavers! A sponge type roller usually works better then a nap roller. If spraying a solvent based sealer, you must use a heavy duty metal sprayer. Cheap plastic sprayers will not work with solvent based brick paver sealers but they will work with water based. Do not apply sealer to wet or high moisture content pavers! The sealer will turn whitish in color. Let dry for 3-4 fours for foot traffic and 24 hours for vehicular or heavy duty traffic. *Make sure that you follow all manufacturers instructions. Contractor tells me his sealer will cover the milky brown pavers. Do you think that is possible?? Possibly but no way to say for certain that is does not come back and even worse in a few months. To really fix the issue, you have to remove it. Please post the pictures in a size that is less than 1 mb. Thank you I will order it. And which is the best sealer recommended do I can put in in the same order? Thank you! Can you tell us what type of roller to use for the stripper and for the sealer.? I already placed the order for the stripper and for the sealer. Rollers that can solvent based products. 1/2" to 5/8". ok Thank you I wiil be ordering the products soon when the work is finished I will let you know how it turned out. I put an acrylic copolymer sealer and the paver ended in this way. See photos. Can you recomend us agood stripper and a good sealer to fix this? My paver patio needs to be leveled, power washed, seams filled with sand/paver base, and then sealed. Should I power wash or level some areas first? Once removed fully you can reseal. My keystone pavers were reddish color and I have sealed every other year. They have been there for about 10 years. They are turning white color. What do I need to do to get the color back? Have you tried the Surebond SB-6000? Not all of VA is low VOC. Just the counties around DC. New application to a driveway paver system (technobloc) - want a non-shiny wet look (that darkens current pavers). Live in VA so a low VOC state. samples of some water based sealers do not darken at all. What are options? only solvent based? or is there a water based that will achieve the wet look ? Last summer I resanded my pavers following all directions used a polymer sand and then a sealer. Looked great after a nasty winter in Illinois all the sand is gone. Help. I would not do that. The Paver Sealer will already darken the color of the pavers as if wet with water. 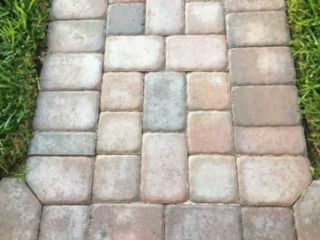 I am thinking of using a water based Dye to bring out the rich color of the pavers before sealing. do you have any recommendations? Do they look okay when wet with water? 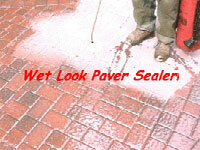 If so then you need to apply a wet look sealer to all of the pavers. You could use SuperSeal25, SuperSeal30, SuperSeal Matte. My husband used a water power washer to clean our back patio (brick pavers) and then swept in new sand. However, the power washing seems to have left some areas very very light, almost white (as opposed to the reddish color of the others). What product can I use to restore these bricks (the really light ones) and enhance all of the bricks? HELP! It looks terrible right now! Not sure what you mean. Recommendation for steps, products, etc? What's your recommendation in the order of pressure cleaning , re sand and sealing . I did not properly clean my pavers before putting down a sealer. The manufacturer suggested xylene but i see your response that that was poor information. what gives? Unfortunately you have gotten some bad advice as xylene is not stripper and does not remove old sealer very effectively. It does soften up the old coating a little but not enough to "strip" it all.